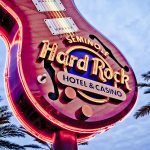 The Hard Rock Cafe in Seminole Hard Rock Hotel & Casino Tampa rolled out a re-designed menu on Thursday. The Tampa restaurant is serving a host of new offerings following more than 14 months of culinary development, intensive research and guest evaluation done by Hard Rock International. One of the new desserts offered is Cheesecake with Oreo Cookie Pieces. Made in-house, a generous helping of Oreo cookies is baked in a rich and creamy NY-style cheesecake with a decadent Oreo cookie crust. An entrée likely to be a favorite is the Cowboy Rib Eye, which is a 16-ounce, bone-in, rib eye steak grilled to perfection and served with two sides. If burgers are an alternative, the Hard Rock Cafe presents a “Tango Burger,” which includes two single premium patties layered with slow-cooked Sloppy-Joe, American and Jack cheeses, tangy barbeque sauce and finished with blue cheese and horseradish mayonnaise. In addition to its menu re-design, Hard Rock International took the opportunity to put itself at the forefront of drink innovation with the introduction of drink serving vessels and techniques. The Air Mexico, a sampling-sized portion of Hard Rock’s classic tasty margaritas, allows guests to choose three flavors including Watermelon, Mango, Cucumber, Blue Curacao, Pomegranate or Wildberry, served with a portion of chips and house made salsa. In addition, the Red Berry Press, Hard Rock’s unique, sweet fruit cocktail made with fresh hulled and sliced strawberries, fresh raspberries, lemonade, lemon-lime soda and Clementine Vodka, is served in a coffee-press style vessel that infuses fruit into the cocktail throughout the drinking process.